After some seriously child-forward Halloween delights, I decided to turn onto a different route. It’s hard to take cupcakes seriously. Cupcakes are happy food. But the flavors of apple cider, goat cheese, and walnuts feel very adult. I feel like cupcakes are the go-to bake sale thing. 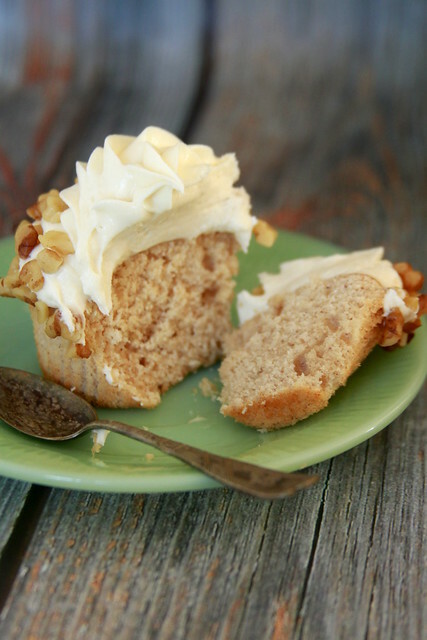 They sit on paper Dixie plates, vanilla or chocolate, slathered with shelf stable shortening-based frosting. But cupcakes can be revived to be pretty and oh-so suave. 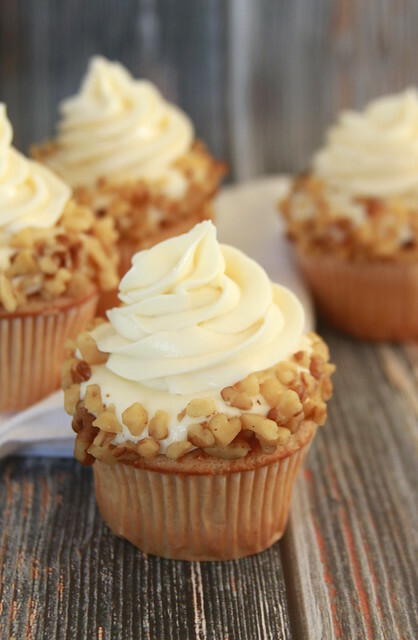 I think the cupcake craze of the 2000s and into 2010s elevated cupcakes. However like most phases, the dessert trended turned its back on the cupcake in favor of French macarons and doughnuts. I guess you can say I’ve aged slowly. It’s taken me a while to appreciate the intense tartness that goat cheese holds. Enjoying goat cheese is just one step away from doing more adult-ish things like stocks and bonds, life insurance, and driving a mid-sized SUV. Rather than having goat cheese on some fancy cheese board, I took the cheese down a notch in fancy-maturity and used it in a dessert. 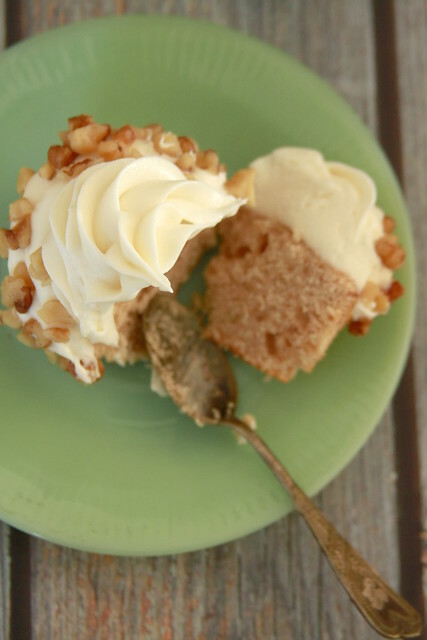 The cupcakes are tender and subtly seasoned with apple cider and cinnamon. Alone in a frosting, goat cheese would be a gritty and granulated mess. Here to the rescue is cream cheese and butter to give the creamy smooth mouth feel. 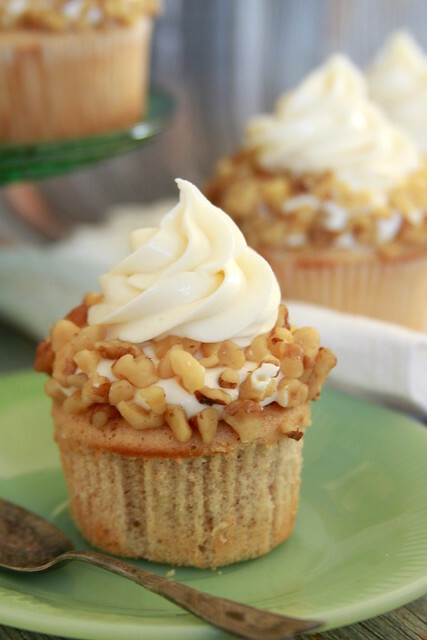 Toasted walnuts garnish the bottom of the cupcakes, giving the cupcake needed crunch. I used two different tips to pipe the frosting. I used two tips for the frosting: a round tip created the base (which I coated in walnuts), and an open star tip made the second final layer. 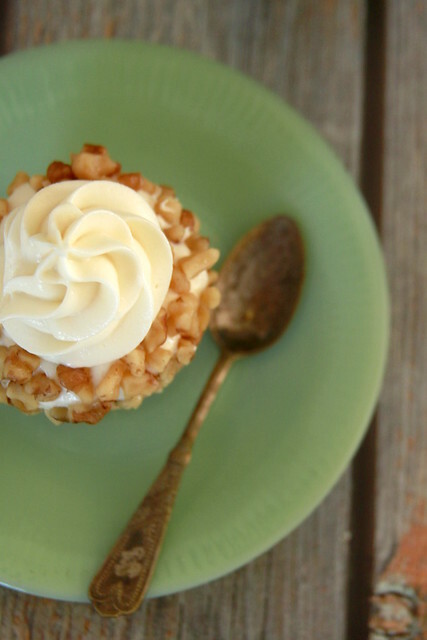 The cupcake to frosting ratio is 1:1 and that might be too much for some. Yet this ratio gives the cupcakes dramatic height. 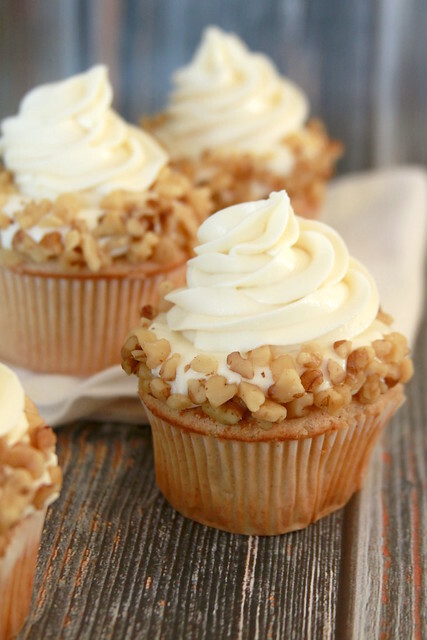 Nothing is worst than those short squat cupcakes you see at bake sales. You know the type. The ones with frosting spread on with a butter knife. The ones with sanding sugar dumped onto the top by some eager grade school child. Those sort of cupcakes are simply dry muffins with a thin coating of canned frosting. 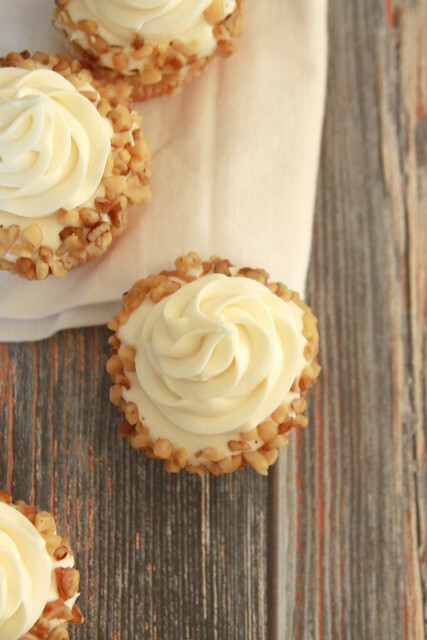 Break that cupcake mold and revive cupcakes from their tired bake-sale state! Preheat oven to 350 degrees F. Line cupcake pans with liners, set aside. Whisk flour, baking powder, cinnamon, and salt together in a bowl, set aside. In the bowl of a stand mixer fitted with a paddle attachment, beat the butter for 30 seconds until smooth. Add sugar and cream on a medium speed until light a fluffy, about 2 to 3 minutes. Scrape the sides and bottom of the bowl down. Beat eggs, one at a time, followed by the vanilla. With the mixer on low, add the dry ingredients in three batches and the apple cider in two batches, beginning and ending with the dry ingredients. 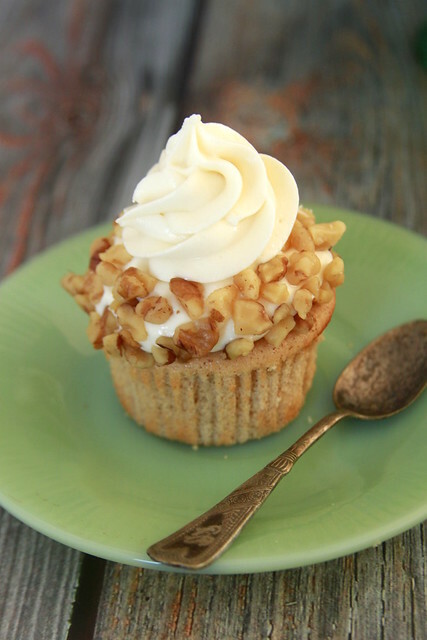 Use an ice cream scoop to portion the batter into the cupcake liners. The batter should fill the liners ¾ of the way. Bake for 16 to 18 minutes, rotating halfway. A toothpick inserted should come out clean. In the bowl of a stand mixer fitted with a paddle attachment, beat the butter and cream cheese on a medium speed until smooth and lump free. Scrape the sides and bottom of the bowl. Add the goat cheese, beating until incorporated. Beat in the vanilla. With the mixer on low, gradually add the powdered sugar. Use a large round tip to pipe the base. Coat frosting base with chopped toasted walnuts. Use a large star tip to pipe the top frosting.